Hanoi (VNA) – Vietnam has actively participated in international activities and organized several important multilateral international events in 2018, which were the important achievements of the country last year, according to Deputy Prime Minister and Foreign Minister Pham Binh Minh. In an interview granted to the press on January 15, the Deputy PM and FM noted that the events hosted by Vietnam had attracted the participation of many high-ranking leaders and large numbers of businesses from other countries. He quoted the evaluation made by Party General Secretary and President Nguyen Phu Trong at the 30th diplomatic conference that external affairs were a bright spot in Vietnam’s overall success in 2018. 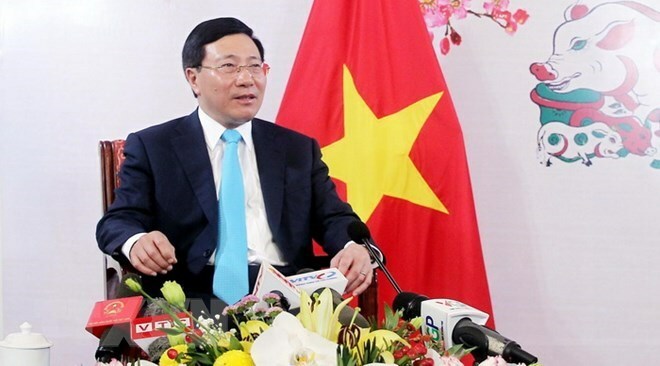 Besides, economic diplomacy has made various imprints on the country’s economic development, he said, stressing that Vietnam has actively joined negotiations for the signing of many free trade agreements (FTAs). The country has so far become a member of, or is negotiating to join, 16 FTAs, both bilateral and multilateral. However, he noted that besides the opportunities, the FTAs also bring numerous challenges. Only when domestic firms improve their competitiveness can they make full use of the opportunities and gain an advantage over other competitors. Asked about Vietnam’s preparation for assuming the chair of the Association of Southeast Asian Nations (ASEAN) in 2020, Minh said the country already established a national committee for the task at the end of December 2017, of which he is the chairman. Noting that this is not the first time Vietnam takes the helm of ASEAN, he stressed that the country always makes early and thorough preparations before each event in order to ensure success. Mentioning the country’s bid to become a non-permanent member of the UN Security Council, Deputy PM Minh recalled that Vietnam had been elected to the council in the 2008-2009 tenure with high votes. Ten years later, considering the country’s performance in the previous tenure along with its current role and position, there will be higher trust and expectations for Vietnam. The Asia-Pacific group has selected Vietnam as the only candidate of the region in the council during the 2020-2021 tenure. According to the diplomat, the candidacy will give Vietnam a bigger voice and higher position in the international arena, and allow the country to involve deeper in the handling of global matters, which suits the national interests. Furthermore, it will help build Vietnam’s image as an active and responsible member of the international community besides its dynamic economic growth.